Earbuds are a highly useful, portable audio solution favored by a humongous user base, from businessmen to sports enthusiasts and hobby musicians. They allow the user to listen to quality audio nearly anywhere, and at any time. They can be highly comfortable, too, and many of them offer noise-cancelling and various other convenience features. Still, due to their status as a relatively inexpensive consumer electronics product, many users tend to simply view earbuds as ‘disposable’. ‘Use’em till they break’ is the name of the game here. However, one can greatly extend the average earbuds’ lifespan by just taking note of some really basic regular maintenance guidelines. By maintaining your earbuds like you should, you will not only preserve their great sound, but will also make them last much longer than otherwise possible. Let’s take a look at some of the most important maintenance procedures. You should definitely be aware of these procedures if you are an avid earbud user. And if you want to keep your device in the best possible shape for the longest possible amount of time. Earbuds, due to their very nature, will be stored somewhere for the majority of their lifespan. Whether they’re in your jacket, in a bag, a pouch, in the glove box of your car or anywhere else, your earbuds are going to experience being tucked away somewhere a lot. That’s why it’s important to know how to properly wrap them up. This greatly extends the lifetime of the audio cable, preventing it from fraying and breaking. This generally means a cleaner look, better audio and overall increased lifespan for your earbuds. To properly wrap your earbuds, simply make a ‘V’ sign with your index and middle finger and wrap the audio cable around them, starting with the part that ends in the buds themselves. Leave some of the cable unwrapped, say, about one quarter. Next, take that part of the cable and wrap it perpendicular across and around the first wrap. With just a few inches left, pull the remaining part through the ‘hole’ that you’ve just created. Pull tight, and you should have a nice-looking, cable-friendly package that is great for prolonging the life of your earbuds. Of course, you don’t just have to care for your earbuds when you’re packing them away; the opposite is true. You should do your best to handle your earbuds with as much care as possible 24/7, both when you’re using them and when you’re not. Broadly there are four major factors to look for, while using your earbuds. We already discussed the latter, so let’s take a look at the former, shall we? First and foremost, the audio cable is one of the more delicate parts of your earbuds. Though most models do feature a thick, inflexible part on either end that prevents the cable from fraying under normal use conditions. It still doesn’t make it impossible, and utmost care should be taken to prevent any damage. This includes handling the cable by the jack when pulling it out or putting it in, for example. Extreme temperatures can also affect the lifespan of your device greatly. If you can, prevent long-term exposure to temperatures in the double-digit negative range on the Centigrade scale as well as anything above 40 degree Celsius to keep the internals safe. Equally as important as temperature is humidity. Generally, like most electronic devices, earbuds feel safer and work better when used in an arid environment, that means no direct physical contact with any liquids and very low humidity levels in the air. And finally, every few weeks, do check for dust and dirt building up. It’s a good idea to give the buds, and, depending on how often and where you use them, the cable itself a good wipe every now and then. Here are 7 tips for guaranteeing a longer lifespan for your earbuds, starting with leaving your earbuds on the floor. Besides the danger of stepping on them, you should never, ever leave your earbuds simply lying on the floor due to the dangers of dust and dirt that might linger there. Also, no matter where you store them, always make sure to wrap your earbuds as described above! Furthermore, you should not leave your earbuds plugged into any device when you’re not using them. Apart from preventing you to wrap the cable properly, thereby endangering its lifespan, a pair of earbuds constantly plugged in is just an accident waiting to happen. In addition to that, please don’t let your earbuds dangle off of places, would you? Although it is a very popular habit, letting the buds dangle freely is a very bad idea. It puts the cable under quite some stress, for example, greatly reducing its lifespan. Not to mention there’s the danger of them falling out completely, possibly getting damaged. 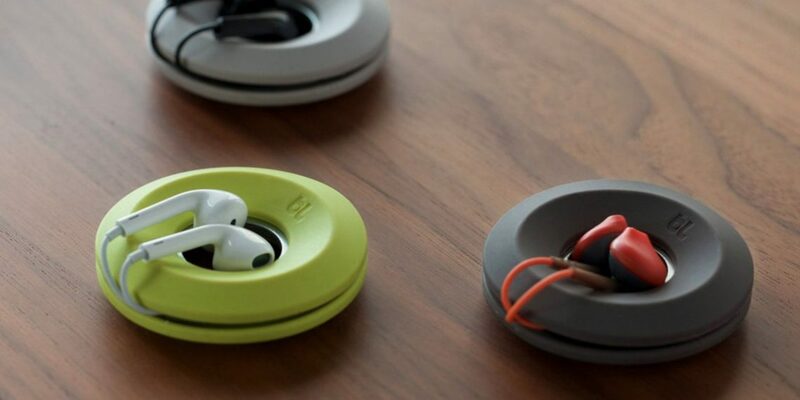 And just what are you doing anyway, storing your earbuds without wrapping them up? If you like listening to music before you go to sleep, make sure to stow your earbuds away somewhere’”wrapping them up beforehand, of course’”as keeping them on during the night could cause an accident. Just think about how often you roll around during your sleep! It’s also a good idea to invest some cash in a protective case for your earbuds. This, coupled with the right kind of cable wrapping, is one of the easiest, yet most effective steps to prolonging your earbuds’ lifespan. And, last but not least, keep an eye on your volume. Constantly blasting it out on full may sound great, but in the long term, it wears down your earbuds almost like nothing else. Congratulations, you have reached the end of this guide. Now you are armed with all the necessary tips and tricks on how to properly take care of your earbuds. You can go out there and listen to your favorite tunes for days on end without any worries whatsoever. By following this guide, you make sure that your earbuds work not only as intended, but perhaps surpassing their specification. After all, who takes as much care of their devices as you do now?